The Chessie example above illustrates the later version of the tooling with opened pilots for truck mounted couplers. The BQ23-7 was a 1981 addition to the HO-scale diesel roster. Two roadnames, Chessie and Family Lines (SCL/L&N), were offered. The model's tooling differs from Bachmann's previous U36B shell and was unique to the BQ23-7 release. This model's tooling provided the basis for the 1990s Bachmann Plus B23-7 release. Information on Wikipedia states the GE prototype model is a variant of the B23-7 and was built in 1978-79. The enhanced cab was a forerunner to today's wide cab locos, but a Q for Quarters was included in the designation and not the standard W for widecab found today. Bachmann's Family Lines models passes the prototype test with respect to SCL ownership and the roadnumber of 5131. 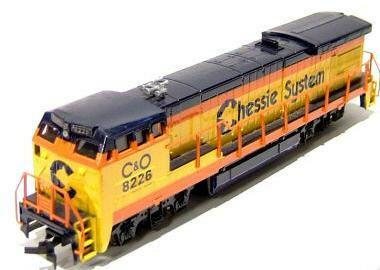 The Chessie System model with C&O 8226 is fiction. The CSX would operate the ten BQ23-7's, following the combination of Chessie System and Seaboard System. The Bachmann shell may be found in at least two variations. Originally, the model had frame mounted couplers and a more fully filled out front and rear pilot. Later examples carved out the pilots and truck mounted couplers were offered. The model departs Bachmann's line around 1990.